Travel-NEPAL.com, The Ultimate Site On NEPAL - Place To See - Bhaktapur. Bhaktapur is also known as Bhadgaon or the city of Devotees, is the third major town of the Kathmandu Valley. 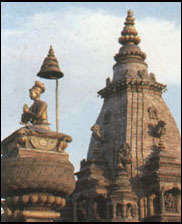 Bhaktapur was the capital of the whole valley during the 14th to 16th century. Much of the towns great architecture dates from the end of 17th century. 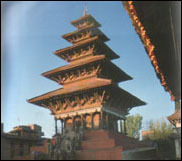 This town is also well known as Newari Architecture town. Bhaktapur rises upon the northern bank of Hanumante River. All foreigners visiting Bhaktapur Durbar Square are charged a fee . Bhaktapur is also famous for their home made curd which is known in Nepal as Khopa Dhau. This is the pottery center of the valley and a visit to Potters' square is a must. You will get to see lots of different types of handmade souvenirs ( wood-carvings, puppets, thankas, caps etc.) inside the Square. This famous 55 Window palace was built during the period of King Bhupatindra Malla in 1754. The entrance to this Palace is well known as Golden Gate or Sunko Dhoka in Nepali, and is the most important piece of art in the whole valley. A Garuda tops the gate and is shown disposing of a number of serpents. The four headed and 16 armed figure of the goddess Taleju Bhawani is below the Garuda. There are various places around the edge of the Kathmandu Valley which offer great views. These places are not so far away from the valley and easily accessible. Nagarkot is generally hailed to be the best for the mountain watchers. People normally spend the night in one of the lodges to see the sun set and sun rise. Nagarkot extends the views all the way from Dhaulagiri in the west to Kanchanjunga in the east. There are number of walks from Nagarkot, down to cheese factory, Sundarijal, Changu-Narayan and Bhaktapur. It is about an hours drive from Kathmandu. This 2,762 m. hilltop is the highest point around the valley and is also known as home to one of the last surviving cloud forest in central Nepal. This place is just 45 minutes drive from the valley and the only place, where snow falls during the winter. Above all, there lies a shrine of phulchwoki Mai. Generally visitors travel by cycle to Godavari and walk all the way to Phulchwoki as it is known for the short walk destination.